Shaker-style cabinet doors are a popular line because they are so flexible. Shaker-Style enhance both traditional and/or modern designs depending on what you pair them with. Add lighting, tile and hardware ideas and you really can change the tone and overall style of a kitchen. Shaker cabinets are offer simple, clean lines, and you often can see them paired with unadorned cabinet hardware. Whether your style is vintage or modern, you’ll find that a Shaker door is one of the most versatile doors styles available. A vintage-style kitchen with white Shaker cabinets is often seen finished with a combination of timeless cup or cup pulls and knobs. For drawers 600mm and wider, two cup pulls are often used. Traditionally you’ll see knobs on doors and cup pulls on drawers. What they do for the kitchen: Add retro flair. What they work well with: Inset cabinetry with exposed hinges, stainless steel, white marble and honed black countertops, industrial-style lighting. Vintage cup pulls are attached to the cabinet with screws from the rear. The face screws are faux and enhance the authentic appearance without compromising on strength and durability. If you are considering a more modern feel from your traditional-style kitchen with Shaker cabinets look no further than nickel or stainless steel tubular bar pulls. This type of hardware is often seen on slab or flat-panel doors, but it works equally well on a Shaker-style door. Tubular bar pulls can be long and dramatic or short and classic. Rail Handles, or tubular bar or barrel pulls come in a variety of sizes and finishes, and the Castella Stainless steel handle makes a great choice if you’re looking to add modern flair to your Shaker-style kitchen cabinets. What they do for the kitchen: Modernize it. What they work well with: Long and skinny mosaic tiles, oversize and rectangular tiles, ebony or espresso stained Shaker cabinets, modern pendant lighting. If style and sophistication is your desired outcome, then consider accentuated length and polished nickel finish to add a little modern glamour. In the same way a font choice affects the look of a logo, the decorative hardware of a kitchen can transform the overall experience of the space. Flat bar pulls come in multiple length, in a sleek stainless steel. What they do for the kitchen: Add a contemporary edge. What they work well with: White or dark Shaker cabinets, square-edged stone or concrete countertops, full-height glass backsplashes, oversize rectangular tile in a stacked pattern. A more traditional kitchen with tall crown molding, a decorative hood surround and a bronze faucet, requires the right handle to excentuate the design. These pulls go by different names, but they’re basically wire pulls with decorative details. Available in a D handle, Swivel Bail and Knobs, they are perfectly suited to a kitchen which has a variety of sizes of drawers, cabinets & doors. 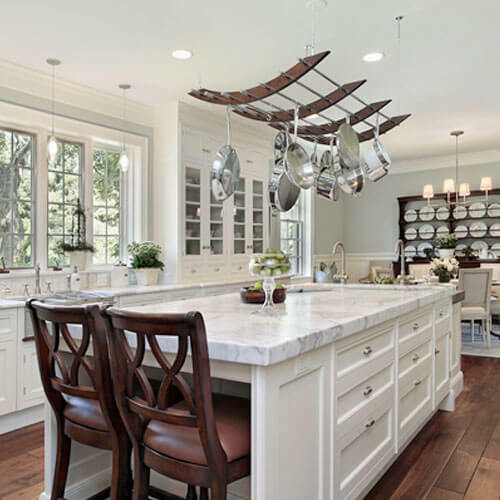 What they do for the kitchen: Allow you to add more decorative moldings and traditional elements. What they work well with: Traditional elements like plate racks, crown molding, bronze accents and decorative hood surrounds.